We are sitting in an awkwardly quiet room. I know that I have just said something stupid. I know this from the look in his eyes. He is staring at me and is thinking how to politely say that I’m obviously suffering from some kind of delusion. He knows that he must be polite, because this is a job interview and he is applying. So I try to think hard what I’ve said, but I fail. And finally, he speaks: “Sir, you are trying to convince me to join your company: small, managed in a family way, non-corporate. But a nice lady from HR has just said that you are over 300 employees. It’s not a small company!” And I realise that he is right. In my mind, this is still a 30 person company fitting in one small open space office. This has obviously changed. Yet, I feel that I am a bit right, too. My company size has changed, but not in the way that I was afraid of. I’d had a chance to see a few big companies before I joined Objectivity. There was a lot of bureaucracy, politics, hierarchy and mediocrity. I never wanted to work in such a place again. I know that many of my colleagues thought this way, as we had come to Objectivity from bigger companies, looking for something different. Maybe this is why we were working hard not to lose the family-like, non-corporate style of the company. We were breaking hierarchical barriers, looking for the best ways to codify and share our culture, even listed the “Seven deadly sins of corporations” to keep an eye at (there were 12 sins on the list, but 7 sounded better). Lately, we have even changed the way the company is organised to create sub-companies that could work like small start-ups. As we are fairly successful in our attempts, I keep thinking about my company as a small one and I put myself in an awkward position during interviews. But I don’t want to bore you to death by telling what to do to reduce the impact of growth. I wanted to tell you about something much more interesting: how to measure the growth, so that you know how strong this will hit you (and where). There are many HR measures that can help you look at the company growth. 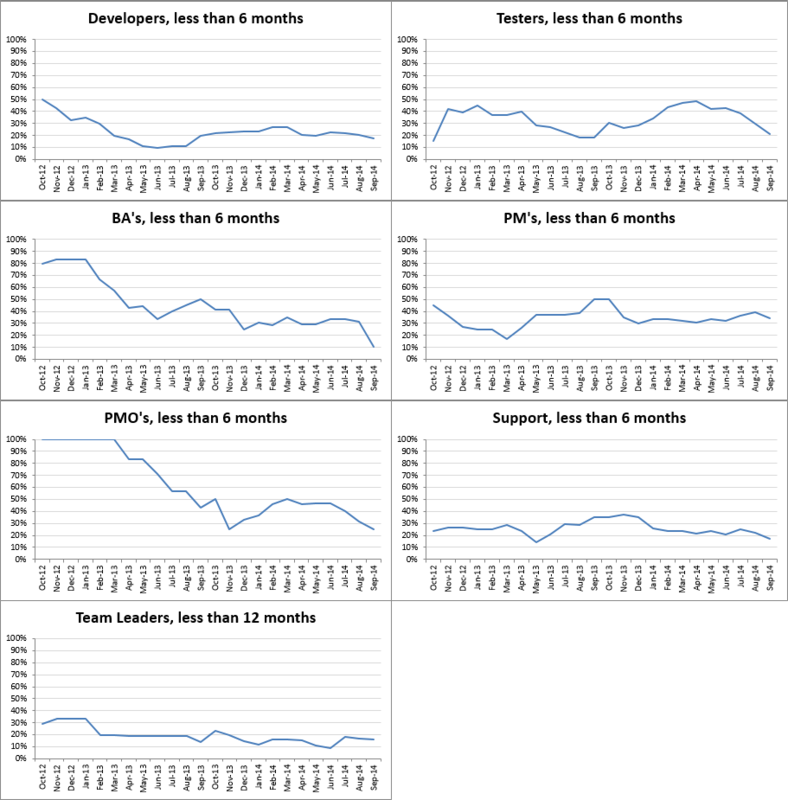 You can look at the turnover, happiness of the teams, percentage of hires after recommendations and many others. 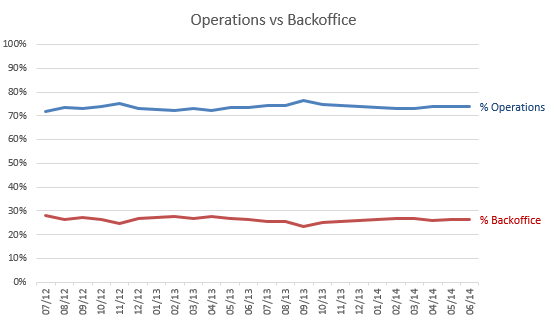 I wanted to show just two of them: back-office size trend and team dilution. The first one is fairly simple and shows what part of the organisation is not doing the core work (in my business: is not producing the software). Many big organisations suffer from fast-growing administration. Management layers are multiplying, internal audit departments strengthen. Also the number of fancy but useless roles is increasing (like these damn data scientists, they just walk around asking weird questions and showing these damn graphs). This simple trend allows you to keep an eye on this threat. Person A: Hey, man. Do you know who should I tell that I have accidentally deleted one of the databases? Person B: No, but you can always ask Bob. He is a veteran here – he joined the company more than 3 months ago. How can a company keep its culture (and ways of doing things), when people who are to share it didn’t have enough time to absorb it themselves. When the company is growing, you will have new people in the team, it’s a fact. But you need to monitor if this is not going out of proportions. And, as the problem will not be the same in all areas of the organisation, you better know where it is the worst. Here you can see that size of the problem differs depending on the role. (Also, what is worth noting – for Team Leaders we use 12 months threshold instead of 6.) When the measure for one of the roles is going up, it is time to react: you can invest more in internal learning, you can ask HR to support leaders, you can codify more rules, etc. Anything that could mitigate the problem. 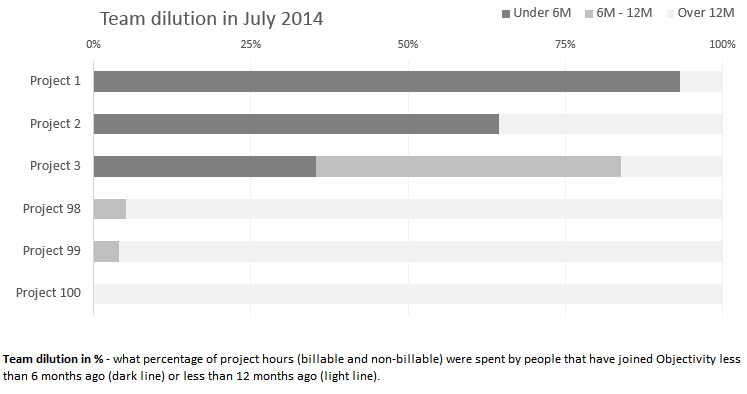 Here we split each project effort into 3 groups: done by people that joined less than 6 months ago, less that 12 months ago and earlier. Again, the distribution is never equal. You can react and support the endangered projects by adding veterans (at least part time), knowledge sharing sessions with other teams, additional reviews, etc. It’s better than firefighting later. In the domain of HR there is a lot of space for thinking outside the box. If you have an idea on how to measure / assess negative aspects of growth, could you share it in comments? Help me keep my company “small”.